Characters are not real people – but readers have to experience the slice of life you portray in your book as if they are. So how can you bring your characters alive? In this article, Damon Suede outlines how to use character action and strong language to lift your characters off the page. One of the odd myths of fiction is that characters are just like people, only imaginary… as if Darcy and your mailman differed only in their fame, wealth, and relative eligibility. That’s nonsense, of course. Characters share some characteristics with people but only enough to help them fulfil their function: to extract satisfying emotion from an audience. One of the most obvious differences is that characters have to earn belief, while actual people get the benefit of the doubt. If we can see them and talk to them, then we assume they exist. Characters have to convince an audience to believe. Characters don’t feel. Characters aren’t born. Characters don’t actually disobey their creators, although at times it feels like they do. The feelings are real. The characters are not. An emotional teenage girl, a befuddled oldster, a patronizing matron, and an Oxford don all speak differently. The fiction writer’s task is to convey their speech with idioms, syntax,vocabulary, and language. When does a character pause? Why does a character pause? Do they use run-on sentences? Speak in clipped staccato? Or, master the use of conditional phrases and subordinate clauses? You won’t be searching for the 401 words to replace saidbecause your reader will know who is speaking. You don’t want to use those words anyway; they take the reader out of the story. Get into your character. Think how they think and say what your character would say. Playing with sentence length in crime fiction. Is it time to trim the fat? 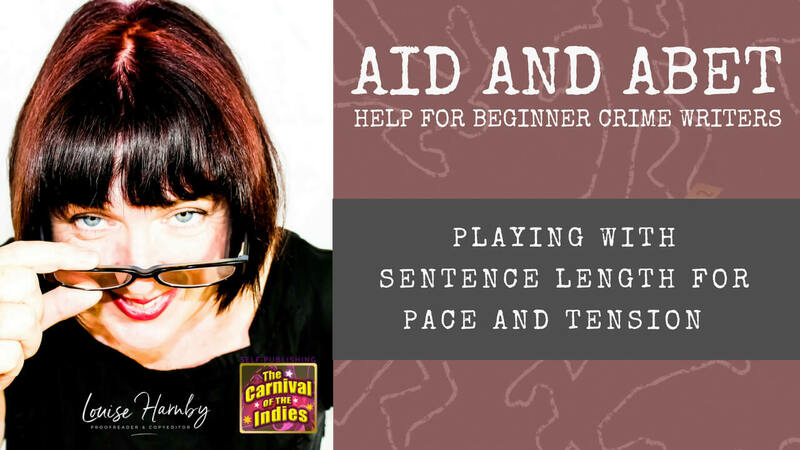 Today’s post is about creating tension in crime fiction with sentence length. I look at how overwriting can mar the pace of a novel and frustrate a reader, and how less can sometimes be more. Around eighty per cent of the books that end up in my editing studio are in the crime fiction genre. One of the most common problems I encounter is overwriting. That’s not because the authors are poor writers. It’s because they’re nervous writers. It takes a lot of hard graft to put enough words on a page to make a book. Yet it takes an equal amount of courage to remove them ... or some of them. These are the kinds of questions that result in anxious authors bulking up their prose.